Osterley Tube station (Piccadilly Line) is a 10-minute walk away, and is the 5th station from Heathrow Airport (15 minutes). Hounslow shopping centre is nearby. A subsidiary of Crompton Guest House, The Bridge House is primarily self-catering, with a shared kitchen available between 07:00 and 21:30. All guests are offered a warm, friendly service and a welcoming smile. Nightly rates from $97 to $259. The rate includes car parking for 15 days. I have stayed in higher stared hotels that are lower in standards than this place. I found this place ok. If I could give a zero, I would. We landed in Heathrow, and their ad said there was shuttle service... we found out after we made reservations there was a charge and did not run after 11. We had to hire a taxi to go to a sister inn to get a key and again to the final destination... The Bridge House. We spent more on fares! We arrived after midnight and over $60.00 in taxi fees... yes, we compared prices, and that was the cheapest. The room was inky dinky, no air condition, AND it had NOT been cleaned. The bed sheets had hair on them and the bathroom toilet had urine stains all over. We contacted the manager, and he was not interested in our concerns. After gagging from the disgusting environment, we left early in the a.m. DO NOT make the same mistake. When I sent the manager pics of the toilets, he was unaffected. He said it should not have happened, but didn't offer to clean it or anything. I will add the pictures, later. Lovely, quaint, and clean. Pipes made strange sound when we took showers, but no big deal considering overall quality of stay. It was very nice place! Thank you! Friendly Personable Staff, Clean and serviceable accommodation. Quite comfortable and work. For a Budget room it was worth the money. I had no problems with any of the equipment / room or staff. Well worth the money for a small room which would sleep 2 completely separate from the main accommodation with ensuite and separate entrance. There is no 24-hour reception at The Bridge House. 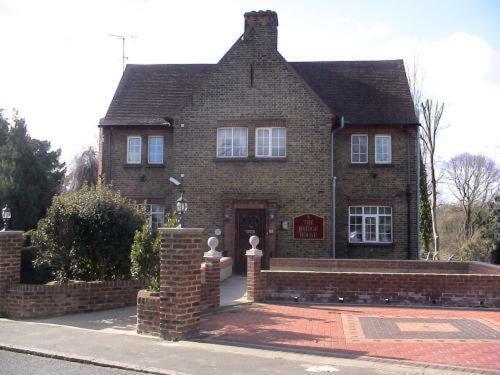 You are required to go to the main office: Crompton Guest House, 49 Lampton Road, Hounslow, Middlesex, TW3 1JG to check-in and collect your room keys. If you wish to check-in later than 21:00 or if you prefer to go to The Bridge House directly, please call ahead to confirm your preferred time of arrival..